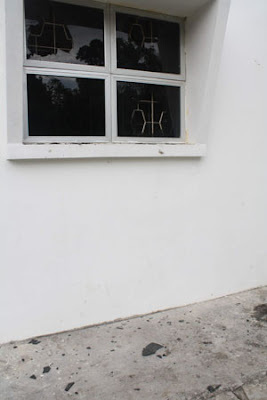 MIRI: Anger that before yesterday appeared to have been limited to Semenanjung Malaysia, seemed to have got into the system of some people in this state when bricks were thrown at the Anglican Good Shepherd Church in Lutong yesterday. “We hope and pray that the incident will not become worse and spread to other churches and other houses of worship in Miri and elsewhere in Sarawak,” said parish priest Reverend Fr Donald Juti who, at 6.05am yesterday discovered that the church’s glass windows had been broken and several pieces of bricks were lying on the floor. “It was still dark at that time and I didn’t notice the window glass panels on the priest and choir rooms had been smashed, not until I switched on the light to go into the priest room,” Fr Donald said. He said at least eight pieces of bricks were lying on the floor. Fr Donald said he immediately informed Fr Ugil Wat of the incident. Fr Donald and the church secretary Edwin Samad later lodged a police report. The police came to investigate at 11am. Sunday service went on as usual although there was general nervousness among the worshippers, said Fr Donald, who added that much of the morning’s sermons were spent on praying for peace and softening of the hearts of the arsonists. “We are nervous but we want very much to act like nothing had happened to our church. We have been living in harmony. It is sad for such a thing to happen if indeed it is related to what had been happening in West Malaysia. “We really don’t want to speculate on the incident and we don’t want to blame anybody as we don’t know who is behind this (the incident). For all we know, this incident might have nothing to do with the incident in Klang Valley,” he said. Fr Donald said the act of vandalism might be the act of people out to stir up emotions so that people of different religions look at one another with suspicion. “We have been able to understand and tolerate each other. This church, for example, has a mosque just next to it. We have been neighbours for a long time with no negative feelings but respect and brotherhood,” said Fr Donald referring to An-Naim Mosque which stands just on the next lot. In this context, Fr Donald urged the Anglican community and other Christian communities here in Miri not to be unduly frightened by the incident, which, he said might have been done purposely to create tensions among Chris­tians and Muslims. Asked if the church would tighten security, Fr Donald said: “No, no, not necessary to do that. It is just a small incident and I believe it will happen again. Meanwhile, an imam of the An-Naim mosque also visited the church after hearing of the incident. The imam condemned the act of vandalism, saying Christians and Muslims in Miri must be strong and not fall to provocation. He said the understanding and feeling of brotherhood among local Christians and their Muslim counterparts must be preserved and they should be proud of the fact that the An-Naim mosque and the church standing side by side is unique and testimony to the existing understanding and goodwill. 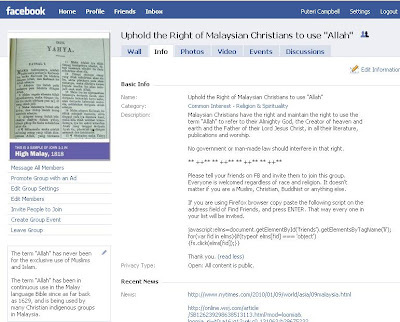 The imam said such act of vandalism was not in line with the 1Malaysia concept. Meanwhile, Miri OCPD ACP Jamaluddin Ibrahim confirmed having received the report of the incident. He said a thorough investi­gation was being conducted and advised members of the public not to make speculations. Orang ari Semenanjung nyin ka beli, nyu kitai di Sarawak kena rampit! Aku begedi amat laban tu meh gereja alai kami sembiang di Lutong din. Sapa kitai enda bulat ati laban pengawa orang ka isin enda tentu pasal? Sekeda ka madah jaku "Allah" nya jaku Arab, nama kebuah orang ukai Muslim di Malaysia ka nginjau jaku Arab nya? Kristian Arab ngena jaku "Allah" enda ibuh laban nya jaku sida, ku sekeda ka sempit runding. Nama kebuah enda ngena jaku Melayu tauka sebarang jaku asal kitai empu? Nya ti ngasuh aku balat agi bulat ati. Jaku tauka bahasa nya utai ti tau dikena sebarang orang. Jaku tauka bahasa nadai ditagang ari dikena barang sapa ti ka ngena. Nyelai endar enti sekeda jaku mina orang ka empu jaku nya aja tau ngena! Kitai Iban rindu amat ma ninga bansa bukai landik bejaku bansa kitai. Bansa bukai pan baka nya mega. Enti enda bakanya nama kebuah kitai di Malaysia diansak bejaku Melayu? Enda ka nya tegal sida ka ngemesai jaku enggau bansa sida?! Aku amat enda setuju enti kitai Kristian nunduk ka peneka orang Islam lalu ngelengkaka hak kitai ti ngena jaku "Allah" ketegal enggai charut. Enda ibuh mayuh kebuah iya. Siti aja udah chukup. Nya hak kitai. Ka kitai nginjau jaku Arab, ka kitai nginjau jaku Melayu, nya sepeneka kitai.